Yes the clown is terrifying, but my heart belongs to the stressed out little Planet of the Apes dude on the end. The vacant Snoopy. That draggy clown. The “phonin’ it in” Charlie Brown. All genius. Not sure what’s happening with the faceless Mr. Skelly. Is that kid just wearing a pulled down hat over his head?? OK. 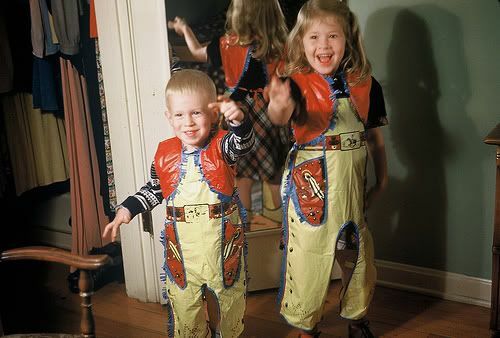 These little kiddos from 1951 are actually really cute. I love that you can see her little dress in the reflection of the mirror. So sweet! 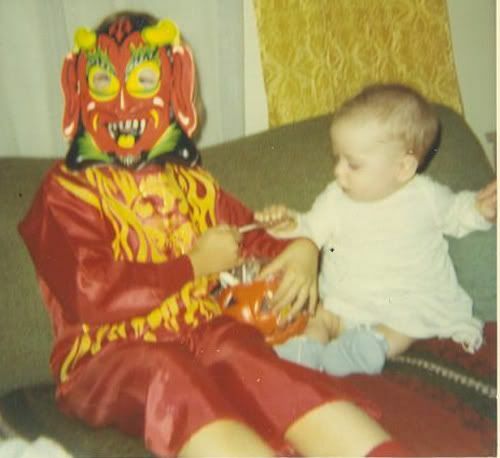 I’m amazed at this nonchalant baby…like it ain’t nuthin’ but a thang….If that devil child showed up at my door step I’d run screaming. I can’t imagine anything more terrifying. This poor child is like a Tretchikoff painting on acid. That poor child….looks like a classic victim of the dreaded, “It’s freezing out there! You wear a coat under that costume or you’ll catch your death of cold!” I always hated when mom made us wear our coats under our costumes. This next one kills me. Devils in a Red Granny Flannel Dress. OK, check out the wig on the little nurse. Hee. I love this one. What child decides that they want to be George Washington?? Mod Darth Vader looking suspiciously like an Ewok…. The Colonel Sanders girl? I mean….c’mon now. 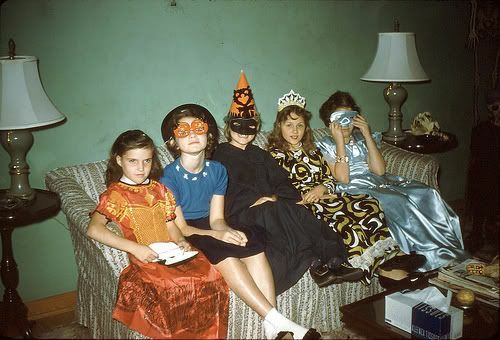 Seriously, I can’t wait for Halloween. 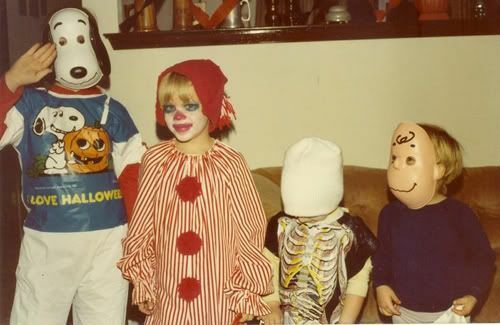 Don’t forget, there is still time to send me your Best and Worst Homemade Costume Photos! Check here for details! We’ll be posting the Costume Parade on Wednesday!! 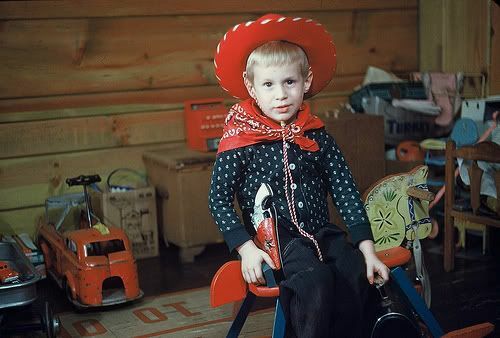 Posted in Vintage Kiddo Photos. 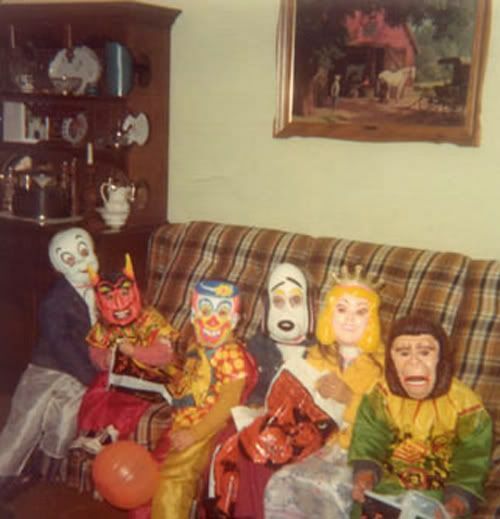 Tagged with 60s halloween, 70s halloween, awkward family portraits, creepy vintage masks, sixties Halloween, vintage Halloween photos. oh man! these are classic! i want to be colonel sanders! the colonel sanders girl is MY FAVE!!!!!!!!!!!! i love this post. 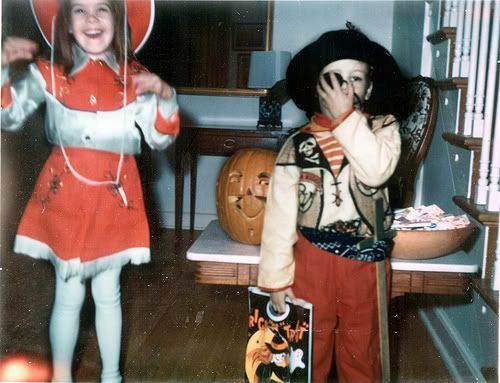 you’ve inspired me to dig into the vaults around here to see if i can find any vintage freckle halloween pics. 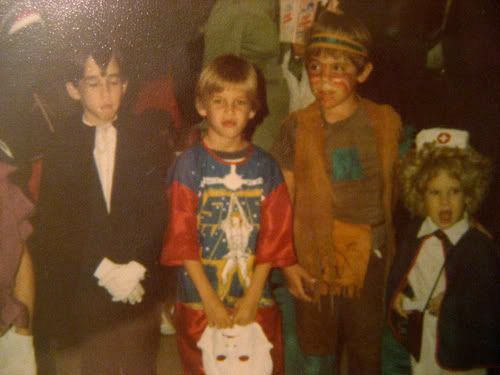 i remember going as the statue of liberty, a bum (what?!) a witch and a very madonna inspired 80s girl. to name a few. oh my. 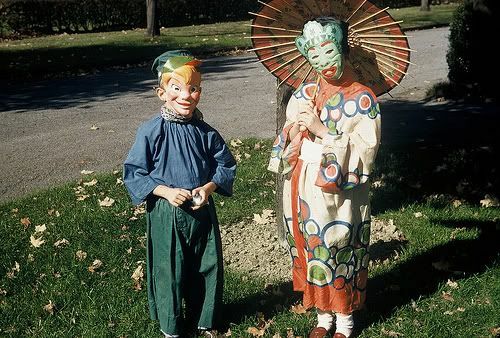 Oh i would loooooove to see vintage freckle trick o treating!!!!! find them picks, girlie!! 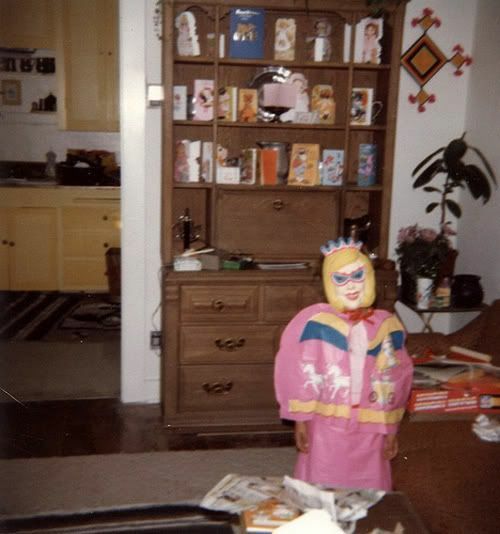 I remember those Gawd-awful masks. I used to get bubble gum all stuck to the inside of mine. Ahhh, memories. Great post!! 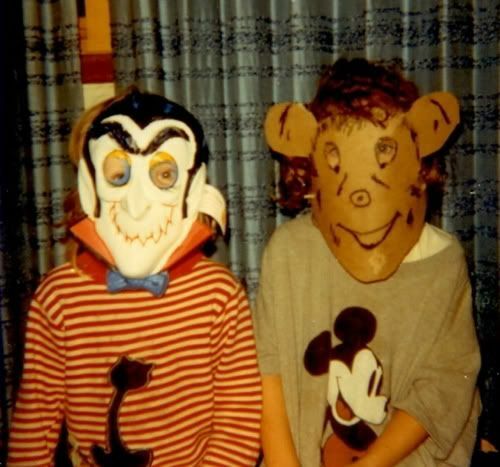 I was going to see if I could find some of our kiddie halloween pics but remembered they were on our old computer. 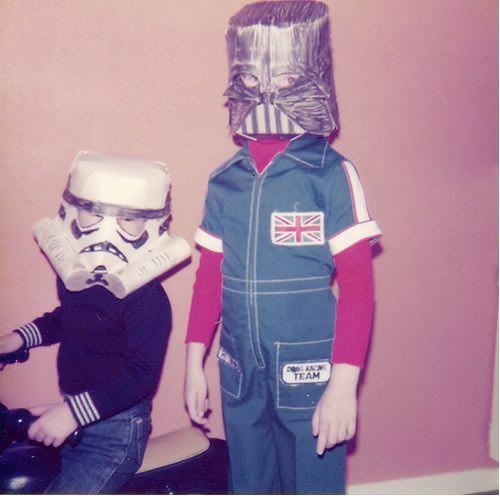 I’ll have to dig tonight to see if I can find them 🙂 These costumes are hilarious, I love love love the homemade star wars ones! 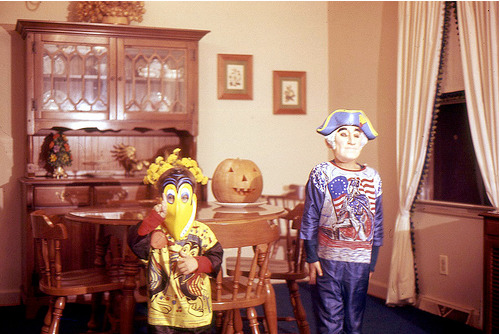 I had some pretty atrocious halloween costumes back in the day, most of which featured a snowsuit underneath. 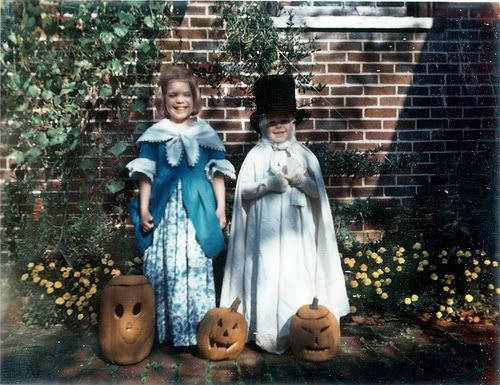 And by the by, Alix, I was MARTHA Washington one year. Betsy Ross the year before. Not that I picked it, of course–my mom is a history buff. iam freaking DYING HERE ALIX! good god!! thanks for the endorphins!! i am looking through the vaults now as well…..
so friggin funny. i’m crying. wow! 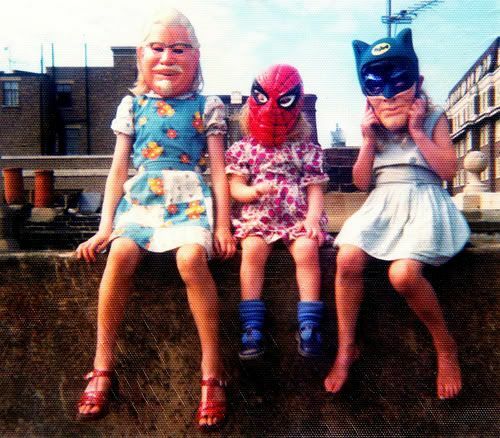 there are some REALLY creepy masks going on here! YIPES!!! and btw, i just noticed the Halloween logo. LOVE IT!!! I was just thinking about this last week when I was at Target. I miss those plastic mask! 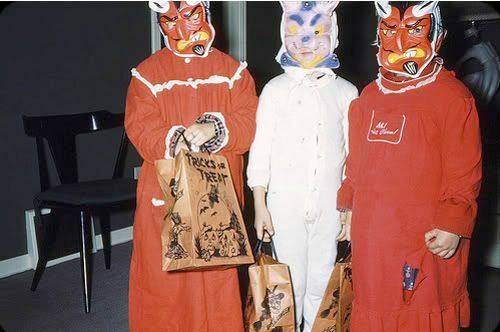 I actually had a Pee Wee Herman costume that had one of those masks. It was awesome. Just about pee’d my pants. I couldn’t figure out Colonel Sanders for the life of me.